The NovAtel Smart-MR series GNSS receivers has a 23 pin Tyco Ampseal connector. In that connector are pins for power, three serial ports, and some other things. NovAtel offers a streamlined cable for these receivers that is 15 feet long. For applications that require a cable longer than 15 feet, it may be best to build a cable to the desired length. When the receiver is going to be outside, you should select a cable that can stand up to sun, heat, water, and (depending on the application) be oil resistant too. If the cable is going to move, you will want stranded conductors. Since the cable will be carrying serial data, you should select a cable that is shielded and has low capacitance. Power requires two conductors capable of carrying more current than you fuse the circuit for, likely 2 or 3 amps. Each serial port will require an additional 3 conductors. Thus for power and two serial ports, 8 conductors are required. This combination of requirements can be difficult to find in a single cable. The car audio industry uses a product commonly known as "speedwire", which is a 9-conductor, 18-gauge cable. The audio market has similar requirements of stranded low-capacitance conductors and shielding around the cable. 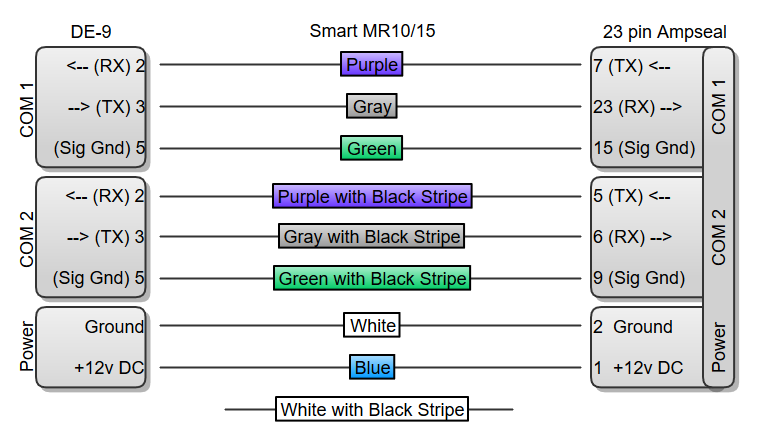 Unfortunately, the audio industry uses a conductor color scheme that doesn't include a red or black wire. I use the following color scheme for conductors when building a data cable using speed wire. The white wire is covered by red heat-shrink tube, and the blue wire covered by black heat-shrink tube.